I slept like a rock last night. One of my favorite features on the Fitbit is the sleep tracker, which measures how long you sleep each night, including periods of restlessness and number of minutes awake. It’s all based on your movement, and while obviously it’s not 100% accurate – if I’m sitting on the recliner watching a movie and not moving for more than an hour it thinks I’ve fallen asleep (come to think of it, that’s often the case anyway) – but for the most part it provides a pretty close measurement of my nightly sleep. My average for each of the past three weeks: 7 hrs. 6 min., 7 hr. 16 min., and 7 hr. 7 min. Which is about right. Last night I ended up with 8 hrs. 49 min., my most since October 8. No wonder I felt so rested and refreshed today. This morning I made a pot of coffee and jumped right into my novel. I knew it was going to be a busy day and wanted to get as much written as possible before running errands. I left the apartment mid-morning, stopping at Burgerville to grab a quick bite to eat on my way to Value Village. 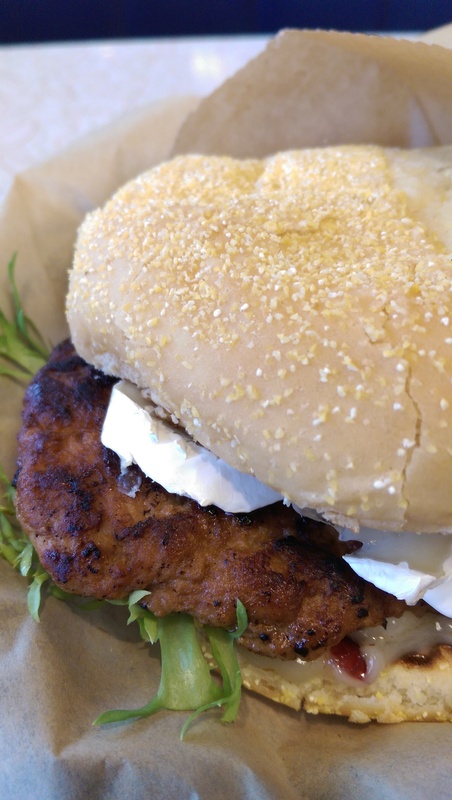 I tried their new Brie Cheese Turkey Burger with Cranberry Aioli, which wasn’t bad. Then at the thrift store I stocked up on as much as I could before they permanently close their doors in a week. They were already disassembling many of the racks and fixtures and depleting their stock, so I’m glad I stopped in when I did. Hit up Grocery Outlet for a few things on the way home. At 2:38 p.m. I got the text I’d been waiting for. Come and get me! Tara wrote, and she didn’t have to ask me twice. I picked her up from the airport and we kissed passionately for three seconds before she ushered me along. Turns out our rendezvous point is a loading zone for commercial vehicles only and supposedly there’s a $1000 fine if they catch you. I love my wife, but that’s one hit to the wallet I can ill afford right now, so we cut our kiss short and drove home. Later we walked a few blocks to Sweet Tomatoes for dinner. In the pouring rain. It was falling hard and steady most of the day, so we pretty much got soaked. We’re home now with our feet kicked up, getting ready to watch The Shining. Normally we try to catch it right before Halloween, but obviously our schedule didn’t allow that this year. I’m so glad Daylight Savings Time ends tonight. Setting your clocks back is so much more rewarding than moving them forward. I would prefer we never move the clocks, but I’m stubborn that way. Me, too! I hate DST. I’d be willing to meet in the middle. Change them a half hour next time and then just LEAVE ‘EM BE!